It has rained and rained, but it’s not all bad. The weather is warm, but after 3 days, we are a bit sick of it. With this level of rain and warmth, you can almost see the grass grow! It hasn’t stopped us taking in this beautiful part of the world. We have visited 4 waterfalls, the first Millaa Millaa Waterfall, approximately 23 kms from our park. Russ walked into the falls, down many steps. Fortunately, there was another road which we took later, where I could see the complete falls, which were beautiful. A few kilometres on and we arrived at Zillie Falls. 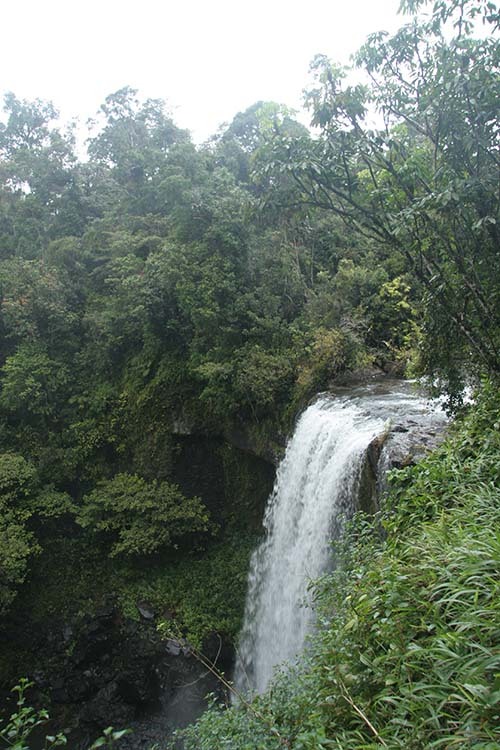 These were very strong falls, but we were unable to see the whole fall, because of an undergrowth of weeds. The next falls were Ellinjaa Falls, with at least 100 steps. 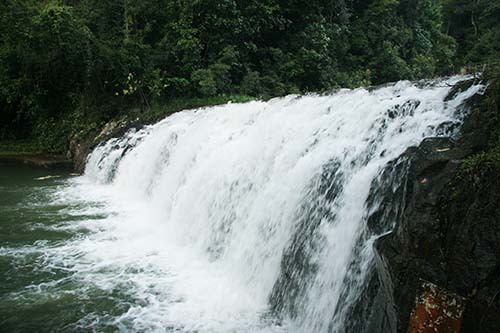 Russ said they were absolutely beautiful, with the water forming a lacy veil over the rocks on its descent. 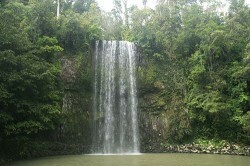 On the way to these falls a cassowary crossed the road just in front of us, we were very lucky to see one. Afterwards, we found a cafe, near Millaa Millaa and had a delicious meal. I had cajun chicken salad, with avocado and sour cream and Russ had quiche, chips and salad. Probably the best meal we have had so far. 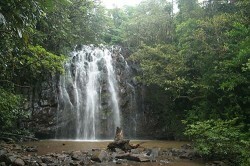 Later we walked to Malanda Falls, which are right next to the caravan park and you can walk right up to the falls. Saturday was a housekeeping day with shopping in Atherton, sooo busy, and tidying up the van. On Sunday we drove to Yungaburra looking for platypus, but we had no luck, and it was too wet for an enjoyable walk so we went home and prepared a pizza for tea. Tomorrow we move to Cowley Beach near Innisfail where we will stay for a week, before we meet up with Trish and Dave at Carnarvon Gorge on 7/8.